I can't sleep to music. Well, that's not true. I can't sleep to music that is uptempo or has vocals. The rest? Fair game. My favorite album to drift away to dreamland to is Jason Falkner's exquisite Bedtime with the Beatles. (FYI: Volume One is much, much better than Volume Two.) But sometimes you just need a little more variety, you know? At 390 songs (Almost 23 hours' worth!) the novelty value was off the charts. I gave it three nights before abandoning it because the playlist was terribly ineffective. If my brain wasn't actively trying to figure out which song was being covered, the higher pitched toy piano playing the melodies on most of the songs was keeping me up. So I moved on to... what's the opposite of classical thunder? Classical light breeze? 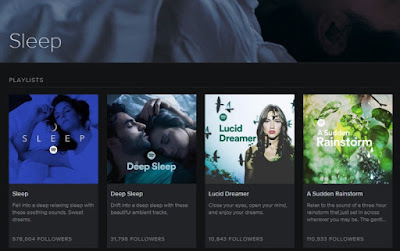 Anyway, I gave some of Spotify's pre-made "Sleep" playlists a spin for a week or so. Specifically, the piano, classical, jazz, ambient music, and various meteorological ones. Not bad, though none of them were terribly deep. That's not much of a concern, though, when the objective is to only hear a few songs before losing consciousness. With my brain now on the same wavelength as the music, a new problem was brought to the fore: advertisements. While I absolutely love Spotify Premium, I did not renew after my three month trial ran out. Uninterrupted music on demand is an unnecessary expense and I've eliminated all of those that I reasonably can. (See, I'm currently unemployed.) So that means I have to hear ads every few songs. It's no big deal really. Except when I'm trying to sleep. Every time one would come on it would momentarily snap me out of it and I'd go all Admiral Stockdale - WHO AM I? WHY AM I HERE? - before I managed to make my way back into dreamland. Clearly this wasn't working. 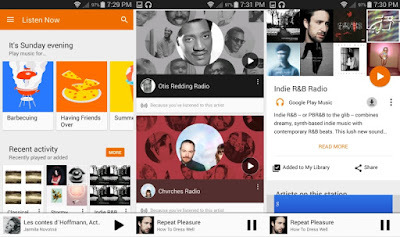 Then Google Play Music suddenly offered a free version of their subscription service. 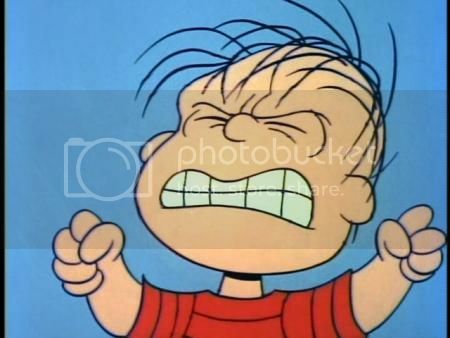 I was *this close* to putting Pandora on my phone when Google made the announcement. 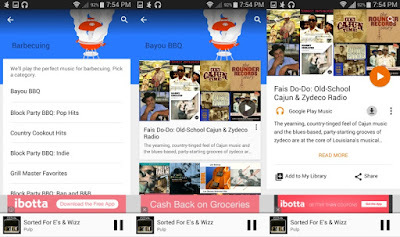 Figuring that Google Play Music was already installed on my phone and storage space there is a precious commodity, I nixed my plans. It was time to see what Google brought to the increasingly crowded streaming music market. Like Spotify, it also has a section of curated playlists for sleeping. Unlike Spotify, it doesn't tell you which tracks or how many songs are in them. 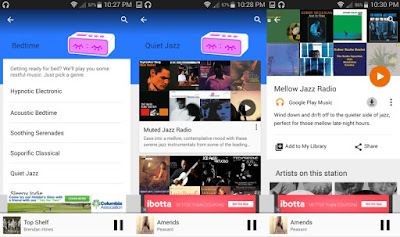 Intrigued by its air of mystery, I put two of Google Play's classical and jazz stations to the somnolent test. Guess what? I freakin' loved it. While this new free tier is ad supported, those come in the form of banners and pop ups. There was nothing audible to jar me out of sleep. 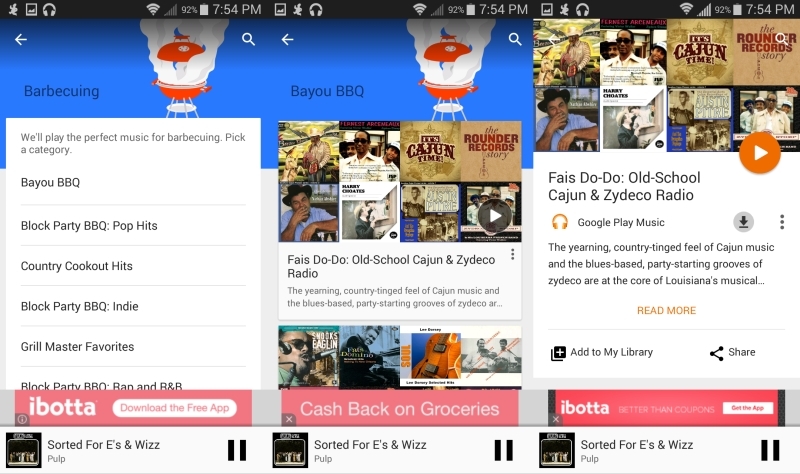 For that reason alone, Google Play Music radio is a keeper. I've put many hours into the service during my waking hours, too, and have been quite enjoying it. There are a whole lot of stations to choose from. There was one weird occurance early on when I booted up the '90s Alternative Rock Radio, possibly the genre I'm most into. (Nostalgia is a hell of a drug.) The first song it played was by the Gin Blossoms, followed... the Gin Blossoms. Odd. That's only happened once. Other than that I haven't notice too much repetition so far. I'm particularly loving the Indie R&B station, which has exposed me to a bunch of new artists and songs. My current favorite discovery is AlunaGeorge's "Your Drums, Your Love". For the past several years I've tried to make it a point each summer to delve into a genre I'm not overly familiar with, like classic reggae or Memphis soul. I hadn't planned on do that this year, but indie R&B - or *snicker* PBR&B - found me. I've been a fan of The Weeknd for years, but now it's time to take it further. Welcome, new soundtrack to the remainder of my summer. But I digress. In the end, each streaming service has its strengths and I'll use both accordingly. Spotify will be for when I want something familiar via the many playlists I've make there. Google Play Music will come in handy for night time listening and when I want to discover something new. Ain't technology grand? This is a marvelous time to be alive. Well, unless you make your living solely through creating music, I guess. I'll let David Lowery sort that out.